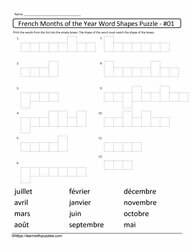 Are students struggling with letter patterns, spelling and vocabulary? 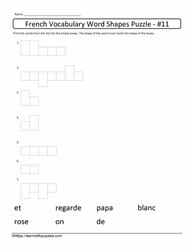 Word shapes puzzles use the shapes of letters (squares, rectangles) to spell out words. 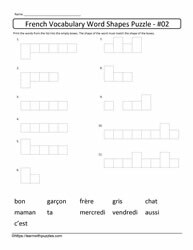 In this case, the focus is French vocabulary. 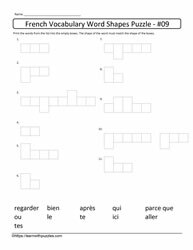 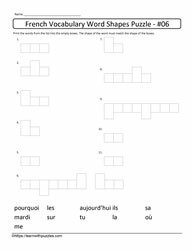 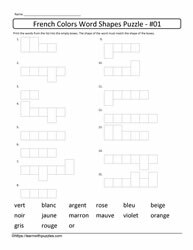 To solve the puzzle, students need to compare the list of words at the bottom of the page with the letter patterns found on the sheet and then fill in the blanks with the correct words. 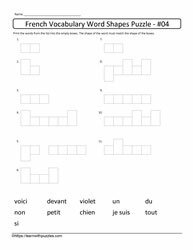 These puzzle types support letter pattern recognition, organization skills, fine motor skills, while helping to consolidate spelling and vocabulary building.